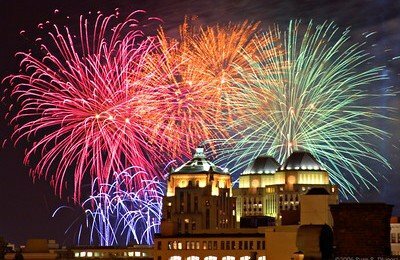 The Cincinnati Dinner Train will operate its fireworks train from the Cincinnati Gardens area to the riverfront and back. Avoid all of the traffic and arrive in style on the Cincinnati Dinner Train! DINING CARS — Purchase a four top table in one of our three dining cars. A full four course meal will be served during our ride downtown. Our full service bar car will be available for purchases of beer, wine and mixed drinks. If using Gift certificates, must pay an additional $32.15 upgrade per gift certificate. Price $115.00 per person. Ages 12 and older. Additional information information can be found by clicking on this link. *Pricing does not include sales tax, bar purchases, nor gratuity. Please call 513-791-7245 to book your reservation or book online from our website under RESERVATIONS and choosing September 2, 2018 as your ticket date.